Portrait statues are as old as civilization. Julius Caesar and his buddies have been dust for two thousand years, yet we know what they looked like. Their statues are a great window to the past. Photography changed the function of the statue. Money didn’t have to be spent on a big bronze effigy when there were actual photos of the distinguished person. By the 1950s portrait statues were becoming passé. Oddly enough, photography made it easier for artists to turn out lousy statues. What—my Famous Person in Bronze doesn’t look like the pictures you’ve seen in books? That’s because I’m portraying the inner person! You just don’t understand Art. Attitudes toward history were changing, too. Scholars were telling us that economic, social, and political forces were the things that counted. The “great man” theory of history was as dead as—as dead as Julius Caesar. Here in Chicagoland, we went through decades of trendy public art. Yet in the last dozen years, we’ve seen a revival of classical portrait statues. One of my favorites is the Jack Benny Statue in Waukegan. Though he was actually born in Chicago, Jack Benny (1894-1974) grew up in Waukegan and always claimed it as his hometown. 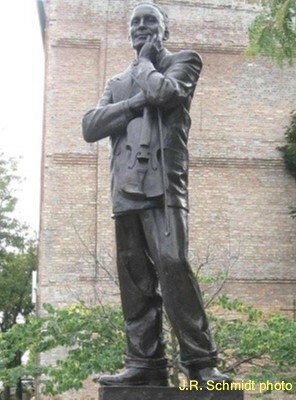 He trained as a violinist but found he had a greater talent for comedy. In 1932 he began the weekly radio program that made him famous. The show made the transition to TV in 1950, continuing on the air until 1965. The Jack Benny Statue is located in a small park at the southwest corner of Genesee and Clayton Streets in downtown Waukegan. Erik Blome of Wauconda won a nationwide competition for the design. The $50,000 cost was paid for by public funds, private donations, and benefit concerts by the local symphony. It was dedicated in 2002. Waukegan has shown us that the portrait statue is still viable art. More recently, a California town has followed the example. One of the running gags on Jack Benny’s program was a California train conductor who called out stops to “Anaheim, Azusa, and Cuc-a-monga.” In 2010 the town of Rancho Cucamonga dedicated its own version of a Jack Benny statue outside its ballpark. On the base of the statue, in small incised print, in the back is the “Your money or your life gag” & Benny’s great response: “I’m thinking it over”!